Mark Wirtz had been working on the idea for a rock opera since early 1967. The basic concept of 'A Teenage Opera' was of sketches of different characters who lived in a fantasy village. These stories were to be told by a young man to a young girl. Wirtz intended for the final project to be animated, and later compared it to the 'Yellow Submarine' by the Beatles. The first song created was the story of Grocer Jack, the local grocer who was taken for granted until he died. Wirtz had the character of Jack in his imagination, but asked Keith West to write the lyrics for it. After West heard the music, he wrote the lyrics straightaway. 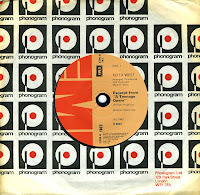 Soon after, the single was recorded at Abbey Road Studios. The engineer, Geoff Emerick, was working with the Beatles, who were recording 'Sgt. Pepper's Lonely Hearts Club Band' at the time. The song was recorded in 'true stereo', a rarity at the time, with the latest technology available. The song itself featured a children's chorus, with singers from Corona Stage School. The single was released on July 28, 1967, and it was one of the biggest hits of that summer. Rumours began circulating about the rest of the project. A further single, 'Sam', was released in October, but performed significantly worse in the charts. Wirtz meanwhile completed '(He's Our Dear Old) Weatherman', which had started out as 'The Paranoiac Woodcutter'. It was the most complex recording so far, containing more than 100 different sounds. However, like 'Sam', it received very little airplay. The project 'A Teenage Opera' was then shelved. However, in 1996 a cd was released by Wirtz with every track recorded over the years, intended for use in 'A Teenage Opera'. My copy of the single 'Excerpt from A Teenage Opera' is housed in a Phonogram sleeve, whereas the single was released on the EMI label. Presumably the seller didn't have the original sleeve anymore. It didn't matter to me: I wanted to have this historic piece of music.